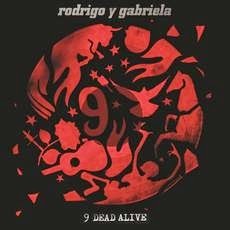 It's been five years since we had an album of original material from Mexican instrumental duo Rodrigo Y Gabriela. On April 29th they'll break that silence with the release of 9 Dead Alive. The album is a concept one, with each track inspired by an historical figure, the likes of which range from Harriet Tubman to Fydor Dostoyevsky to Eleanor of Acquitaine. As one would expect, with inspiration drawn from such a wide range of sources, the effectiveness of the songs is similarly uneven. The Latin rhythms and dueling guitars provide an infectious atmosphere on "The Soundmaker" and "The Russian Messenger". "Somnium" strikes a balance between melodic and feisty, while "Fram" see the pair determined to set a World record for speed-picking. Other tracks are either difficult to listen to or simply not noteworthy. The minimalist snoozefest "Sunday Neurosis" falls into the first category, while the Tubman-inspired "Misty Moses" is planted firmly in the second. The standout is "Torito", a surprisingly funky little number that may actually get you moving. "Megolopolis" succeeds where some of the other songs fail by providing a solemn, elegant and beautiful tune. 9 Dead Alive is more of a curiosity than an album you'll pick up and listen to over and over and over again.